I’ve made no secret about how much I wanted to win the division and secure home field advantage. And I thought it was doable. Seriously doable. But, as I said, the situation could be worse for the Yankees; at least we’re going to Minny as opposed to heading for the golf course or hunting lodge like some teams. And today wasn’t a total loss. It’s always fun to score off Papelbon. The bigger issue confronting us fans right now is the state of the Bombers. Moseley did a pretty good job, I thought. Just a couple of mistakes that my dearly departed grandmother could have hit out of the park. Robertson looked exhausted, Joba did his usual high-wire act, Logan was ineffective and I don’t think Ring has a prayer of making the postseason roster. And then there was the persistent problem of stranding runners. It was painful to watch Jorge hit that dribbler with bases loaded, for example. On the positive side, Gardner has been gaining confidence at the plate, in the field, on the bases. He’s ready to do battle. Lefties. Righties. Doesn’t matter. And Tex is hot at the right time. Plus no worries whatsoever about Cano, who is, quite simply, a beast. So today isn’t about doom and gloom. It’s about celebrating the achievement of getting back to the postseason. And how better to celebrate than to visit with our old pal Surf Dog Bill, the grand prize winner of last year’s She-Fan Video Awards. For newcomers to the blog (or those with short term memory loss), Bill Connell is a local icon here in the Santa Barbara area. A huge Yankee fan, he and his hot dog stand are must-stops both for the hot dogs and the conversation. Here’s a recent article from the Santa Barbara Independent that’ll give you an idea of just how passionate Surf Dog is. 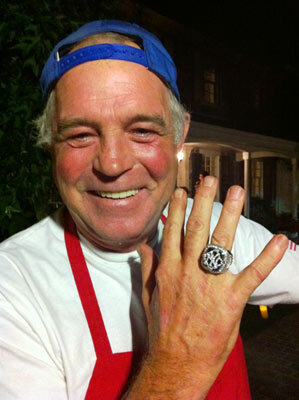 Not only were Connell’s hot dogs a hit with the crowd–to the bewilderment of the gourmet chefs at the party–but Jacobs, impressed by the vendor’s evident passion for baseball, gave him temporary custody of a genuine 2009 World Series championship ring, encrusted with 119 diamonds. Only a couple days later, Connell hit the trifecta–another memorable trip to Dodger Stadium. This time, he took 50 people with him on a chartered bus from his Surf Dog stand in Carpinteria. We expected to see a low-scoring duel between two of the game’s best young pitchers, Tim Lincecum of the Giants and Clayton Kershaw of the Dodgers. Instead, we were treated to an evening of wacky incidents that stoked up the L.A.-San Francisco rivalry. Much to our surprise, the Dodgers got to Lincecum for five runs in the first three innings. Kershaw was in command until the fifth inning, when the Giants got a break, thanks to Xavier being Manny–rookie Xavier Paul, subbing for the injured Manny Ramirez (more slug than slugger these days) in left field, had a flyball drop out of his glove. Three runs later, the Giants trailed just 5-4. In the bottom of the fifth, after brushing back Matt Kemp with a pitch, Lincecum nailed him with another. A smattering of boos was directed at the Giants hurler. When relief pitcher Denny Bautista threw a fastball under the chin of L.A.’s Russell Martin in the sixth inning, the natives grew even more restless. They rose to their feet–almost a third of them to boo, the rest to get more beer. The home plate umpire took offense to an animated scolding by Bob Schaefer, the Dodgers’ bench coach, and ejected him. Kershaw’s first pitch leading off the seventh inning squarely hit the Giants’ Aaron Rowand. Next to “It’s not about the money,” the most laughable sentence in a ballplayer’s repertoire is when a pitcher says about a retaliatory delivery, “It just got away from me.” That was Kershaw’s unconvincing explanation for his last pitch of the game. After he was ejected, along with manager Joe Torre, reliever Hong-Chih Kuo retired the next six San Francisco batters, preserving the Dodgers’ one-run lead. I could not understand why people were leaving the stadium in droves. I guess they got what they came for–a James Loney bobblehead–but they missed a deliciously bizarre scene in the ninth inning. Broxton, L.A.’s massive closer, made his usual dramatic entrance to the thundering sound of Black Sabbath’s “Iron Man” and promptly loaded the bases. Then Don Mattingly, filling in as L.A.’s manager for the departed Torre, made an ill-fated visit to the mound, which technically became two visits when he stepped off and back on the dirt, which prompted Giants manager Bruce Bochy to remind the umpires that was a no-no. They ruled that Broxton, who had begun pitching to Andres Torres, must immediately be replaced (their interpretation was later called into question). Out of the bullpen came George Sherrill, whose first pitch was hammered by Torres to the wall in left field for a two-run double. The Giants went on to win, 7-5. Connell and his busload, predominantly Dodger fans, stayed to the end. “We got our money’s worth,” the Hot Dog Man declared cheerfully. Surf Dog is always “on” whenever I stop by his hot dog stand, and yesterday was no different. He took a few minutes to chat with me. Wait – let me amend that; he took a few minutes to deliver a monologue about the Yanks. Take a look. OK, the Joba part about getting a start? I don’t think so. Otherwise, he’s been pretty accurate in his predictions. At least he was last year. I’ll be visiting him throughout the postseason (let’s hope it lasts awhile) and will pass along his pearls of wisdom. I wish I could pass along his hot dogs too. They’re really good. Is there a Yankee fan who wasn’t hyperventilating tonight? I doubt it. Where/how do I even begin to talk about this game? First: the decision to start Hughes instead of Moseley. Whether it was Girardi’s idea or Cashman’s edict, who cares. It was the right move for every reason, and Huuuuughes rose to the occasion. I feel so much better about our pitching after seeing how he stepped up. Dice K was dealing, so Tex’s bloop single and A-Rod’s homer were enormous. Just huge. Kudos to them for giving us the lead for the first time in ages. A-Rod looks ready and willing to carry this team if necessary. Cano drove home the tying run and is a lock for the MVP now. OK, not a lock, but he sure made a good case for himself tonight. Dave Robertson. Great job in a pressure situation. How lucky are we to have him? Same goes for Kerry Wood. And really nice outing by Joba – yes, Joba – as well as Boone Logan. Girardi was playing Russian roulette with all the moving parts, but the game had a happy ending. Miranda’s walkoff walk (I love typing that) wasn’t a pretty type of win, but who needs pretty. Given the Rays’ loss, we’re only a half a game back in the division. Way to capitalize, Yankees. I can’t not mention the obvious: Mo blew another save – his fourth in the month of September. I’ve been saying, “No big deal,” but maybe there’s cause for concern after all. I’d love to know if he’s injured and not telling anyone, or whether he’s simply going through an ineffective period. I love him too much to even contemplate the possibility that he’s wearing down. And Jorge. Seriously. Not only couldn’t he give us a sac fly when we needed a run, but those throws. Ugh. Why not just send out a press release to other teams that they should run on his arm whenever possible? But I quibble. Tonight was a great baseball game and the Yankees came out on top. (Freya, you promised we’d win and you came through!) I’m going to bed feeling nice and secure. Tonight’s series opener felt like it might be yet another seesaw battle between the two teams, but Curtis Granderson (or Grandis Curtison, as I called him in a moment of excitement) delivered the knockout punch with his second homer of the game. Whatever he and Kevin Long did to his swing worked, and his improved offense couldn’t have come at a better time. With Tex clearly ailing and flailing, Grandy is key to the Yanks’ success. Jeter looked a lot better at the plate too, and Cervelli seemed rejuvenated. Ivan Nova continued to impress – until he kind of fell apart again. I guess he just runs out of gas. Was I about to stick my hand into the TV and slap Logan and Gaudin when they couldn’t throw strikes? Uh-huh. But it all ended happily, if shakily, after Mo closed it out. As for Garza, maybe he should take Pedro Martinez’s line and call the Yankees his daddy. It was nice not to have to play scoreboard baseball during the game. The Yanks kept the Rays in the rearview mirror for another day. Whew. And now a few words about the pre-game activities. Am I the only one who got choked up? What a ceremony, as only the Yankees can do ceremonies. Watching the entire Steinbrenner family come out onto the field, including Mrs. Steinbrenner whom I’d never seen before, was touching, as was the procession of players past and present (Roy White is such a class act) who followed them to Monument Park, and the return of Torre and Mattingly who both got rousing receptions. After The Boss’ monument was unveiled, I was mesmerized by the sight of Mo crouched all by himself staring at it, as if he really was saying goodbye for the last time. Sob! And how about Steinbrenner’s granddaughter and her rendition of “God Bless America?” I wasn’t expecting much, figuring she got the gig because of nepotism, but she was awesome. Bring her back, please! And speaking of anthems, how spooky was Frank Sinatra, Jr.? He not only sounded like his father but has aged the same way (well, maybe a little more jowly). Anyhow, I’m sure it was a great night to be in the Bronx. I’m grateful I was able to see it all on TV way out here in the boonies of California. Speaking of which, I’ll be on a writers panel at the local Borders store in Goleta tomorrow night if anyone’s in the ‘hood. Stop by and say hi. First we lost a heartbreaker last night. Then we jumped out to a healthy lead against Garza tonight, thanks in part to homers by Cano and A-Rod. Then Nova and Logan coughed up the lead. Then Cano tied it up at 7-7 and it was yet another battle of the pens. I was hanging on every pitch from Joba, Wood and Robertson and went nuts with joy and relief when Granderson made the catch of our season. Just look at his handsome face and maybe give him a clap or two, OK? You could tell the team was fired up after that, so when Jorge came up to pinch hit I was ready for something good to happen. And it did. Did he crush that ball or what? Up by just a run with Mo on the mound in the bottom of the 10th – the second straight night of extras – it was tense times. Everybody knew Crawford would try to steal second and make it, so I was getting antsy with all the throws over to first. But what happened next was straight out of a dream (a good one this time). Crawford took off for third and was nailed – absolutely gunned down – by none other than Greg Golson. Who? Yeah, I didn’t know he had an arm either. Fast? Sure. A decent call up? Right. But a missile to throw out Crawford? Flabbergasted. So, it seemed, were the Yankees as they celebrated the win. I haven’t seen Jeter that excited in awhile. This is one series that has earned the advance hype: the two best teams going at it. I can only imagine what Wednesday night will bring. The one thing I do know is that since I’m back in California I returned to my playoff ritual of grilling turkey burgers for dinner during the games, and the rally burgers worked tonight. I will be eating another one tomorrow night. Care to join me? I’ve got plenty of them. I remember saying to myself, “Oh, that’s just sour grapes because the Blue Jays can’t afford to keep A.J.” But those fans were right, and I wish the Yankees had listened. Not that Burnett hasn’t been spectacular on occasion, and let’s face it – we won a championship with him last year. But how does a guy seem to be cruising and then give up seven runs in one inning? Well, sure. He wouldn’t have given up seven runs if Girardi had pulled him sooner. But that’s beside the point. The bigger question is why hasn’t he become a more consistent pitcher – an elite pitcher – at this stage of his career? Is he uncoachable? Is he a head case? Or does he just have too many tattoos on his arms? I don’t know, but tonight’s game was disheartening. Yes, it was fun to watch Swisher hit two out and for Tex to go deep. And yes, it would be nice if A-Rod would get back on track, even if it means cranking out a few measly singles. And big round of applause for the pen – Robertson, Logan and Joba were great. But it all comes back to A.J., who didn’t cut his hands on the glass door again but made my eyes bleed. Are We Happy With Grandy Now???? Joba didn’t even warm up. It’s weird how I still see midges when we play in Cleveland. I was there in ’07 during the ALDS, and tonight I had flashbacks. Maybe it’s time I got professional help. Congrats to Matt Garza and the Rays on baseball’s latest no-no. It must really be the year of the pitcher. I wonder who will be next???? I didn’t think the Yankees would end up winning this game. Not after Pettitte got pounded in the first inning and especially not after he came up lame and left the game after the second. If that makes me a bad fan, so be it. But considering that A.J.’s tantrum yesterday required the use of Robertson and Gaudin, I kept wondering how our much-maligned (including by me) bullpen would contain the Rays today. So how did they do it? They were really good! Here’s a big, heartfelt shout-out to Robertson (huge game saver for him), Logan, Park, Joba and Mo. They let the hitters do their thing and kept a lid on the Rays’ scoring. And speaking of hitters, how about the bats today? David Price didn’t look sharp, but our guys took advantage. Just about everybody contributed. Loved the steals. Loved the sacs. Loved the RBIs. Loved that A-Rod is now at HR #598 and could very well get to #600 during this home stand. I was there in 2007 when he hit #500 against KC, and KC will be in the Bronx later in the week. Could we be seeing this? Getting back to Andy, a grade 1 groin strain? Really? What are we supposed to do if he goes on the DL, which seems likely? Aceves isn’t around. Mitre and Gaudin don’t thrill me as starters. Hughes has an innings limit. All I can say is I wish Cashman hadn’t let this guy go.